William John Visser, a local dairy farmer, war veteran and self-taught naturalist who was the anchor and spiritual leader of a vast but close-knit family, died peacefully on Feb. 6 at the Christian Health Care Center in Lynden. He was 96. 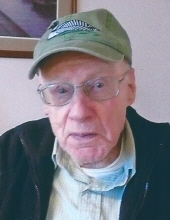 Bill was born in Whatcom County on Jan. 10, 1923, the 11th of 12 children, and lived on the family farm on the Visser Road for nearly a century. He remained single, but as the last survivor of his siblings he was like a second father throughout the lives of 23 nieces and nephews – as well as their spouses, children and grandchildren, along with innumerable neighbors and friends, and even a number of random acquaintances. Bill attended Lynden Christian School through 6th grade, and earned a GED while in the military. He proudly served in Guam at the end of World War II, and was called up again during the Korean War. Between farm chores he read insatiably about nature, astronomy, geography and political news, and taught himself woodcarving, taxidermy, bird-watching, marksmanship and other pursuits. He kept the farmhouse grounds impeccably landscaped with a wide variety of interesting flowers and home-made ornaments, and raised exotic chickens, pheasants and waterfowl. He was a brilliant amateur photographer, and used what was then cutting-edge color film technology to document the lives of farmers and other ordinary people on the war-scarred Korean peninsula during his service. He later delighted generations of relatives and friends with his professional-quality work, in evening slide shows back on the farm. As an adult he was an expert duck hunter and trout fisherman, and a passionate conservationist who loved being in nature. He read sophisticated news analyses and could discuss geopolitical and scientific developments in incredible depth. He loved humor, from goofy puns to dry, edgy wit; some of his jokes were so subtle that they took hours (or days, or years) to really kick in. More than anything else, Bill was a dedicated Christian who truly lived his faith. He effortlessly accepted people despite their shortcomings and helped make the farm a family center and refuge, a place where anyone could show up without notice – even stay for extended periods – and be made to feel absolutely at home. He was especially loved by children. He tirelessly entertained generations of young relatives and friends with farm tours, bicycle rides, fishing expeditions, hikes, and card and board games, meanwhile offering seriously important guidance and encouragement in a way that was so gentle and good-humored that it merely felt like fun. Bill continued to set an example for the many people who gathered around him in his last days, consciously facing death with astonishing peace, courage and grace. The values he reinforced – curiosity, humility, humor, loyalty, cheerful forbearance and unconditional compassion – came to characterize an enormous family that eventually sprawled across much of the world. memorial service will follow at 10 a.m. at Second Christian Reformed Church. Memorial donations can be made to Lynden Christian School. Bill’s family is especially grateful to Fran and the other staff at the Christian Health Care Center for their loving care. Funeral services are entrusted to Gillies Funeral Home and Cremation Services. To send flowers or a remembrance gift to the family of William Visser, please visit our Tribute Store. "Email Address" would like to share the life celebration of William Visser. Click on the "link" to go to share a favorite memory or leave a condolence message for the family.